three × = 18 Required Please enter the correct value. 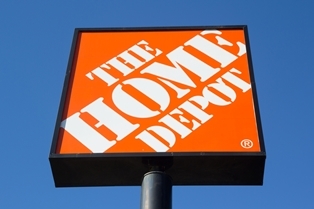 Home Depot Inc. (NYSE: HD) stock was up 6.1% this morning (Tuesday) from yesterday's close, and touched a 52-week high of $88.72 after the company's second-quarter profits and earnings per share (EPS) topped analysts' estimates. HD announced EPS of $1.52 on revenue of $23.81 billion. That beat consensus estimates of $1.45 per share on revenue of $23.61 billion. Last year, the company reported EPS of $1.24 during the second quarter. Revenue was up 5.7% from the previous year. Profit for the quarter was $2.05 billion, which was up from $1.8 billion last year. Same-store sales in Q2 were up 5.8%. Analysts had been expecting same-store sales growth of just 4.4%. The company noted that the number of transactions increased 4.2% to 409.7 million. On those transactions, the average spent per purchase was up 1.8% to $58.43. Home Depot also raised forward guidance in today's report, saying it expects EPS of $4.52 for the full year, which is $0.10 higher than its previous projection. Sales figures were kept in line with previous projections. HD said that it will be continuing its $7 billion share buyback for 2014. It has already bought back about $3.5 billion in shares. For Home Depot, the rough winter hampered sales earlier in 2014, but today's report shows that the company rebounded enough in the spring to compensate. The company said that a late spring led to higher sales of yard merchandise in the second quarter. Aside from last quarter's weather-induced sales dip, Home Depot has now beaten earnings estimates in four of the last five quarters. "In the second quarter, our spring seasonal business rebounded, and we saw strong performance in the core of the store and across all of our geographies," Chairman and Chief Executive Frank Blake said.